To make the cooked glutinous rice flour for coating: in a fry pan, stir fry raw glutinous rice flour on medium low heat until the flour turns light yellow. Remove it from the heat. Set aside to cooling down. Mix all the ingredients for the dough in a large bowl and then steam the batter with medium heat for around 20 minutes. Transfer out and stir it using chop stickers or anything you prefer and then set aside to cool down. Knead the dough until smooth and then divide into 15 small portions, roll each to a small bowl and then press into a round wrapper. (For coloring the wrappers, see notes)Wrap the fillings in, roll to around bowl and then shape with moon cake shaping tool. 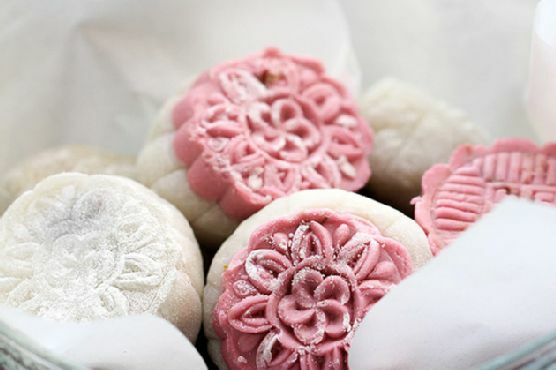 Pre-coat your tool and hand with cooked glutinous rice flour or roll the wrapped ball in cooked glutinous rice flour before shaping.